If you don’t get involved, decisions about these live-saving programs will be made without you. Republican Representatives Ryan and Toomey have each proposed plans to decimate Medi-Cal and Medi-Care, health insurance coverage for a third of the U.S. population. Enough Blue Dog Democrats voted for the bills to pose a real threat to these programs. It’s possible aspects of the Ryan or Toomey bills will be implemented in a compromise on some other issue. Keep your eye on D.C. and work to get the Tea Party out of Congress. 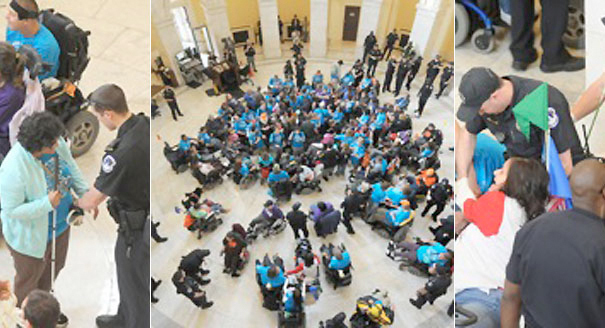 In May 300 people with disabilities protested the Ryan budget plan in D.C. Many were arrested when their demand that Ryan face them went unmet. In the meantime, California has its best chance ever to pass a state-wide single payer health care plan. We talk with Steve Weiss of Oregon’s Independent Living Resources and Dr. Hank Abrons, Board President of the California Chapter of Physicians for a National Health Program, NHP California. Hosted by Eddie Ytuarte and Marissa Shaw. This entry was posted in Activism, California Budget, Eddie Ytuarte, Health Insurance Reform, Marissa Shaw, Politics, Protest and tagged California Chapter Physicians for a National Health Program, Dr. Hank Abrons, health insurance reform, Independent Living Resources, Oregon, single-payer, Steve Weiss. Bookmark the permalink.